Realism is the quest in my current studies. 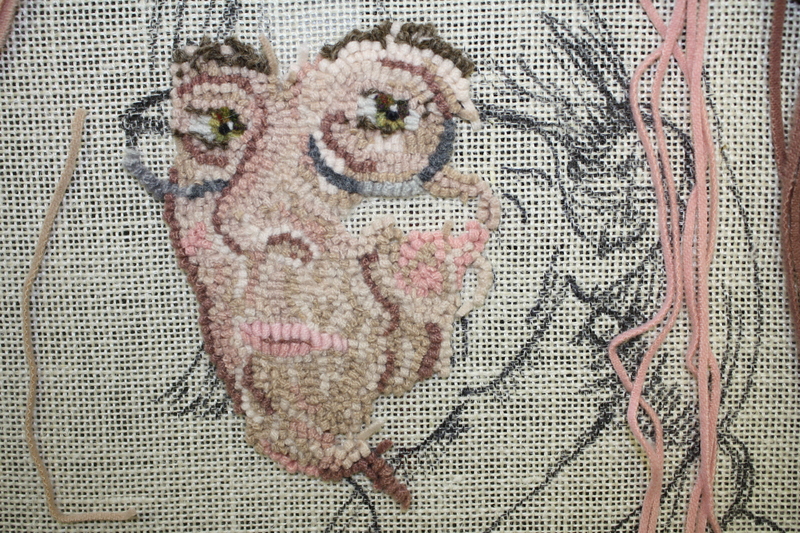 I decided to work a self-portrait close to life size using #3 strips (3/32″ wide) for detail. 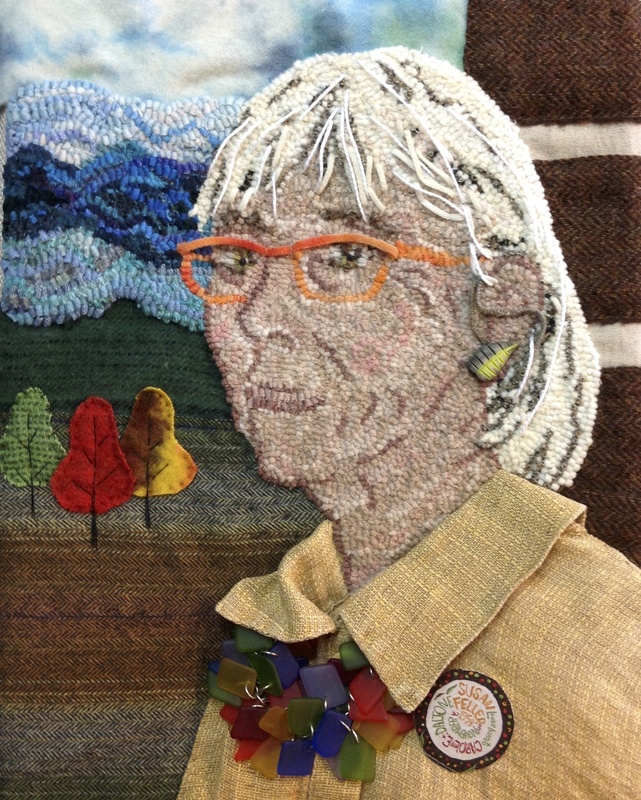 A group in Harrisonburg, VA brought instructor Donna Hrkman in for three days and I took advantage of her expertise to start the project. The lesson which stayed with me was to use line of pronounced value to infer shape, attitude, texture, form. Our brain will finish the picture based on its knowledge. Lesson 1: PREPARE I sent this photo to Donna who created a pattern using a grid to enlarge the details. I also ran the photo through an app for iPad called uSketch and selected a washed out version with strong main lines. This image was enlarged to fit a 12 x 16 format and directly sketched using a lightbox. 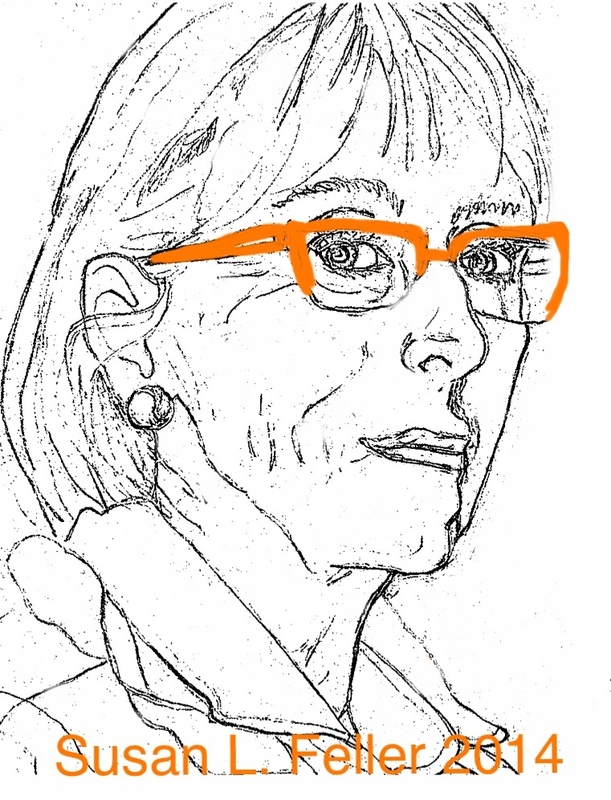 I then drew the portrait by eye (ending up with softer features than the direct sketch.) By drawing the pattern myself several times I was prepared to notice nuances and hook the shapes and lines. Lesson 2: If the subject is close to you, draw the design yourself. I used Donna’s pattern and my guides trying to replicate what I was seeing not my mind’s interpretation of the subject. You will see the first image (worked on for two days) needs severe sculpting to become recognizable to my friends as me. Lesson 3: Color can draw attention and lead the viewer to a conclusion. Glasses, hair, and background elements are in strong recognizable colors depicting me in 2014. I had brought along the actual drapery fabric from the photo as background but Donna suggested I use symbols to highlight my rughooking journey. 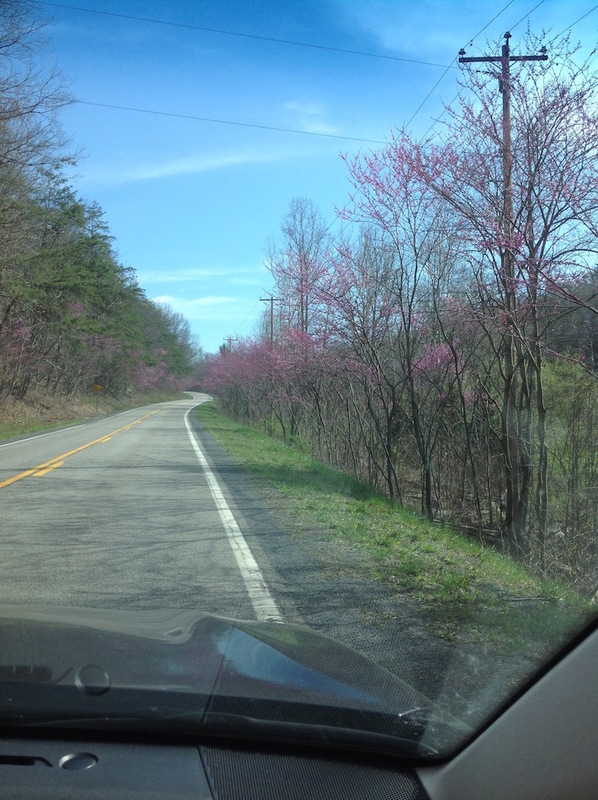 I selected two award winning designs My Mountain State and Mountain Treeline. The abstract hooked blue/purple skyline reproduces the first and the appliquéd colored tree shapes infer the latter and my favorite season. One more element that describes me is living in a log home here in West Virginia. I decided to take the right third behind the face to show that structure. Simple horizontal lines of dark texture and natural linen became the logs. Lesson 4: Simplify but complete the story. I almost forgot a major element in Ruckman Mill Farm’s pattern line is FRAKTUR designs. What motifs could I insert into this natural setting that would read PA German folk art? Of course! The circle from Baptism Certificate which has my birth date, parents and my name was printed and laminated to become a pin on the shirt. I signed the piece and added one more symbol all in one. Lesson 6: Use the right tools from your tool box. 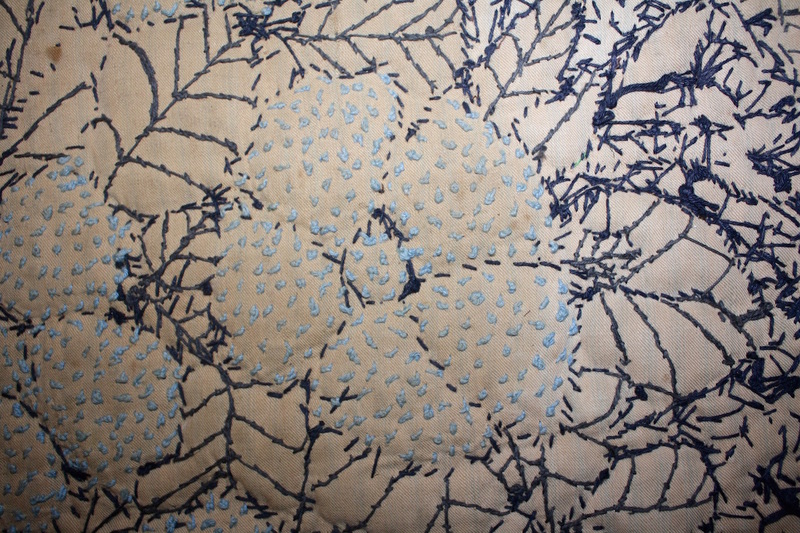 My life has involved textiles since childhood. 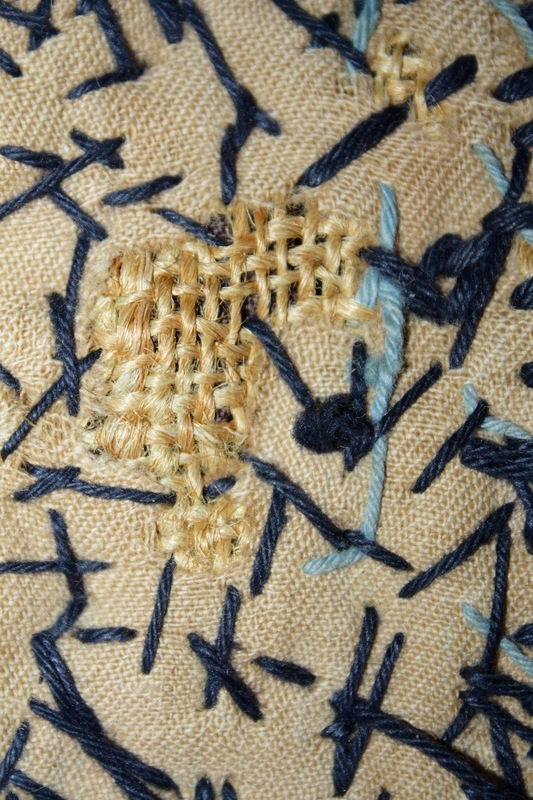 Hand sewing, embroidery, dying fabric and using found objects often shows up in the wall art I create. No reason to restrict this historical portrait to just rughooking. 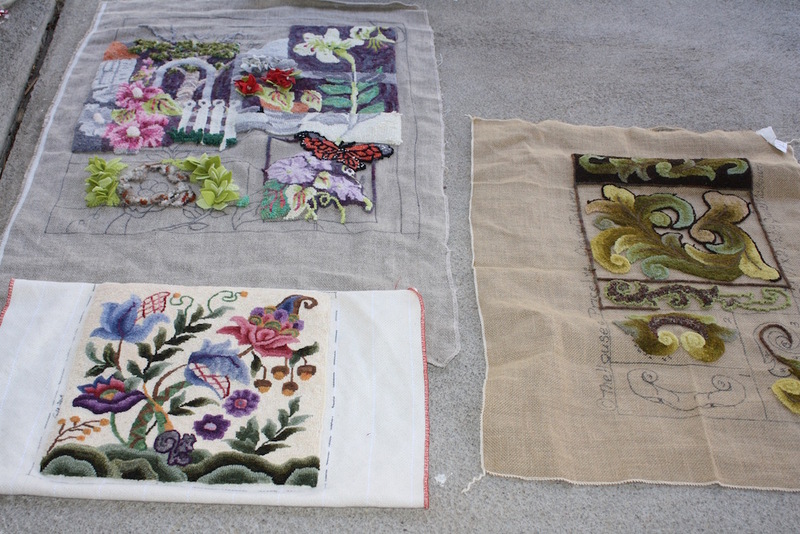 I added my favorite linen shirt, sea glass jewelry, embroidery and appliqué to enhance the hooked features and intend to finish the piece with a tramp art frame. What fun! 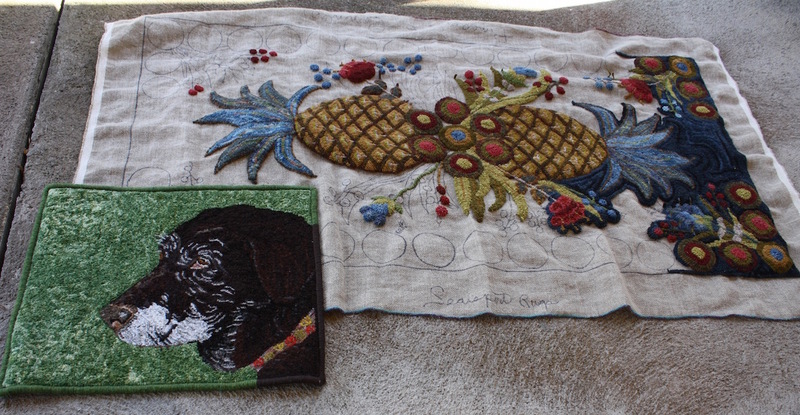 This entry was posted in elements and design in art, Fraktur Design, hooked rugs, rug hooking workshop, textile art and tagged Anne-Marie Littenberg, Donna Hrkman, fiber artists, frakturs, hooked rugs, Ruckman Mill Farm, Stackpole Books, Susan Feller, Susan L. Feller on September 22, 2014 by Susan L. Feller. I just reviewed photos from workshops this year. Many lessons were taught, dozens of lessons learned, and plans were made for next year …. all reasons why I teach. See the calendar for workshop sites in 2015. I flew to Mesa Arizona in January right in-between the coldest spells in West Virginia. 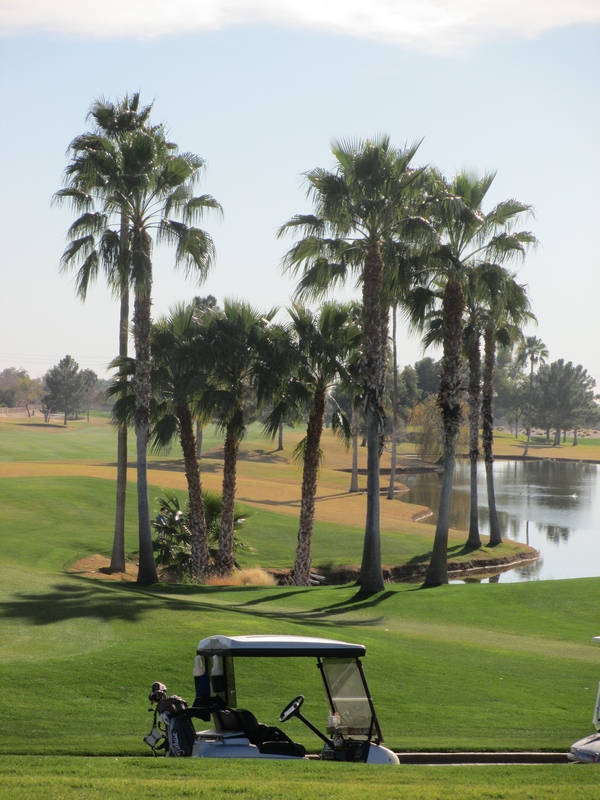 People came down from South Dakota to escape the cold and others ‘wintered’ in sunny Arizona. The projects were colorful and three days went too quickly. The class at Cedar Lakes Rug School was filled with sixteen eager students. Some had finally signed up with me after a few years of seeing work by other students and others repeated with new projects and goals. At the end of the week, I complimented them all, referring to this session as a Masters Class. I was challenged, they contributed and every project was well on its way to being a great piece. I am teaching here again next year, email Nancy Blair at thhkrugs@altelco.net for details. 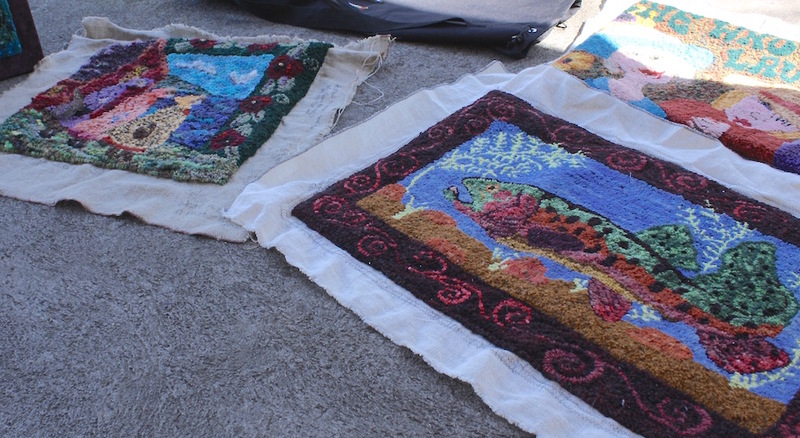 The topic at Green Mountain Rug Hooking School in Vermont was the Moods of Color. We did get to hooking designs based on a mood the participants brought but began the three days with several exercises. On the blackboard each posted a word under one of six colors. Before looking farther what would you say about Red, Orange, Yellow, Green, Blue and Purple? 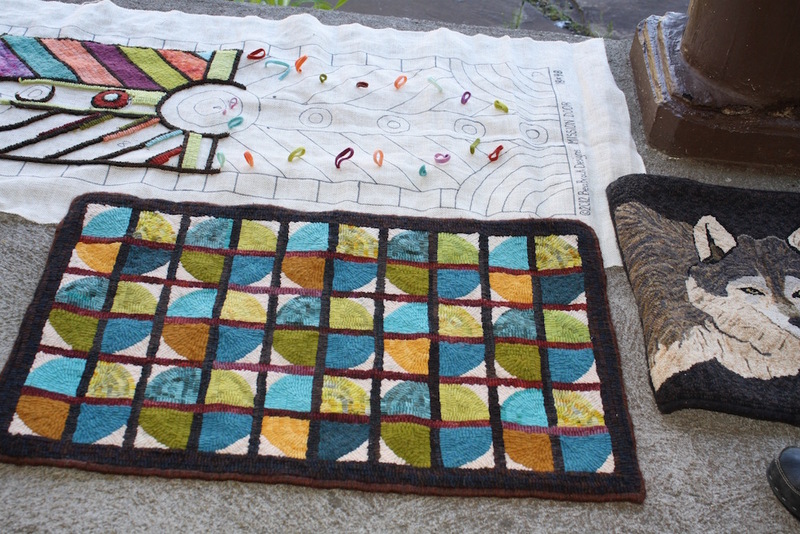 Manistee Rug School in Onekama, MI is coordinated by a guild rather than a business. Volunteers for every job join together bringing in the new members and adapting each year to the needs of all. This was a repeat for me, the first time was in 2011. I made a point to dine with a different instructor each evening, making new friends and delving deeper into old friendships. 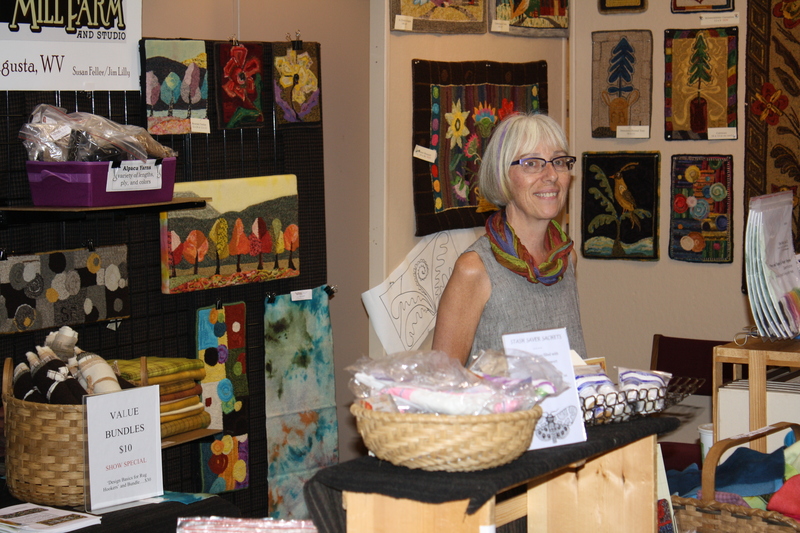 The class included beginners, pattern designers, experimenters, folk painters and abstract artists. Diverse and challenging, their projects evolved well over the week. 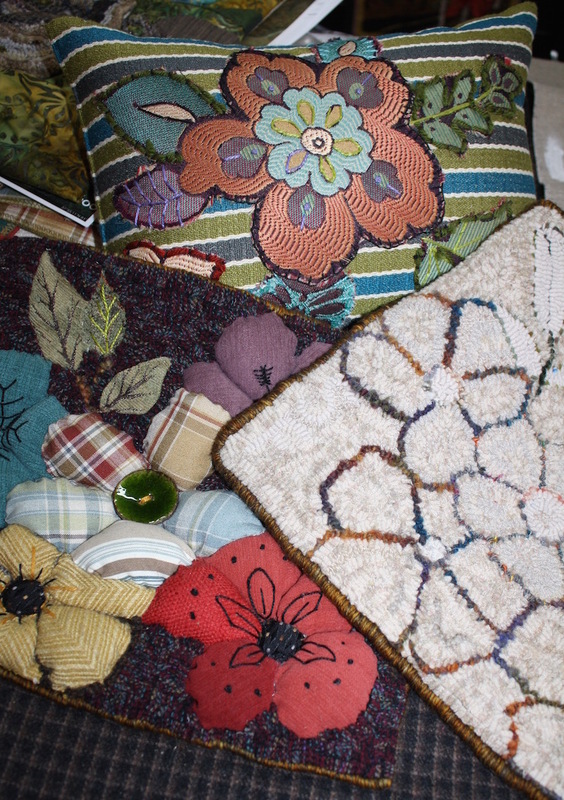 Sauder Village Rug Week is in Archbold, OH is in its 18th year. 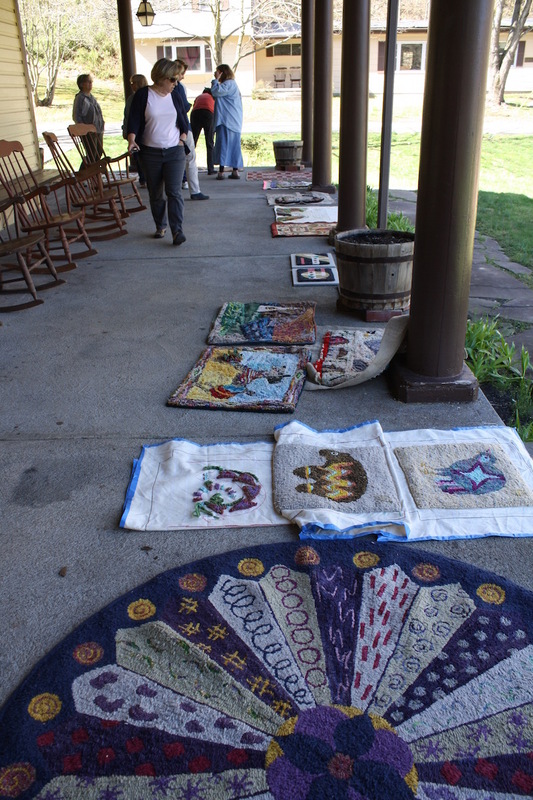 Ruckman Mill Farm vended again right next to Dorr Mill Store in the Exhibit Hall where we enjoyed the Celebration rugs and special collection of Esther and Judy Knipe. 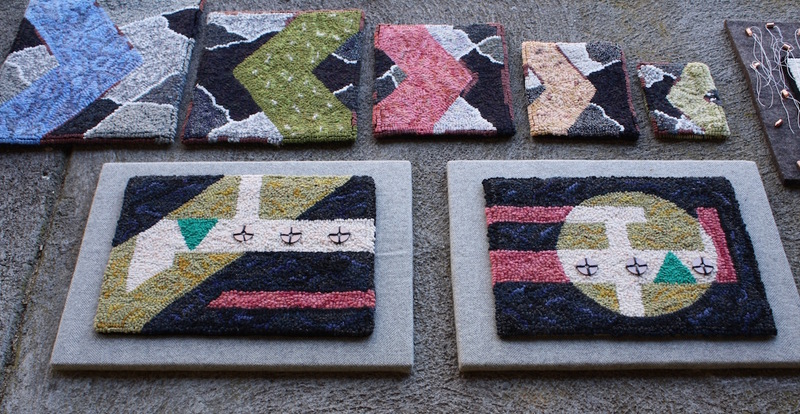 The workshop I taught covered a wide variety of ways for Finishing Hooked Rugs, (title of new book by experts in each technique… including a chapter on finishing work for gallery exhibits by me). We used the exhibit to explore finishes, talked about the appropriate new technique for students work and using a small sample “learned” three techniques. Response from the students was to offer this again. 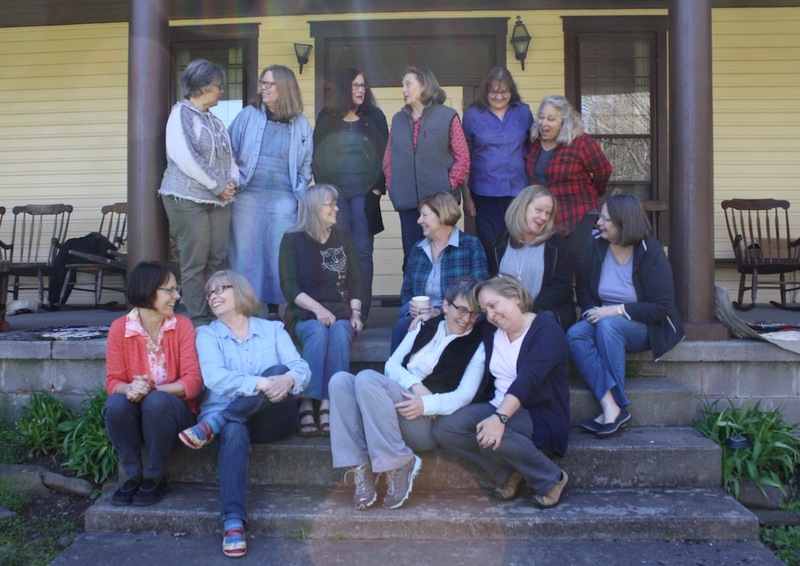 Look for class schedules at SauderVillage.org in early November. I will be teaching several different classes all week. 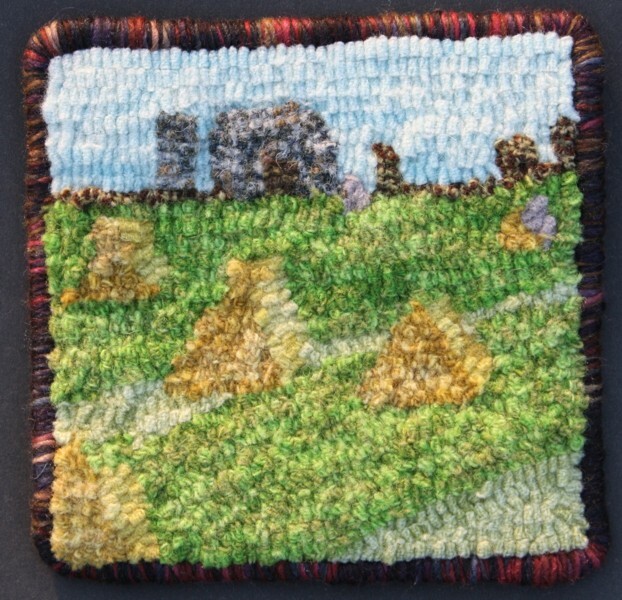 This entry was posted in elements and design in art, hooked rug workshop, rug hooking workshop, textile art, travel, Workshops and tagged "rug camp", Green Mountain Rug Hooking, hooked rugs, Manistee Michigan, Ruckman Mill Farm, Sauder Village on August 28, 2014 by Susan L. Feller. This design is finally finished in my eyes. Thanks to several critique sessions this summer. The composition came together easily, an odd number of large motifs, connected with organic (curved) lines to a small vase placed within the outside border to anchor the design. I used templates from ‘Design in a Box-Frakturs’ and the quirky principles of balance the PA German Fraktur artists had in their repetoire. Then came bringing the lines to life. I photographed each of the changes and will highlight some lessons. Click on the first image and then you can see all in larger format by using the arrows. During one workshop where I used the images as a lesson plan, a student commented in awe at the multitude of changes I had made. To me that is what makes a project part of my process in learning. Kits and following directions are for a goal… completed item. Working on a design to achieve your knowledge of GOOD is growth. 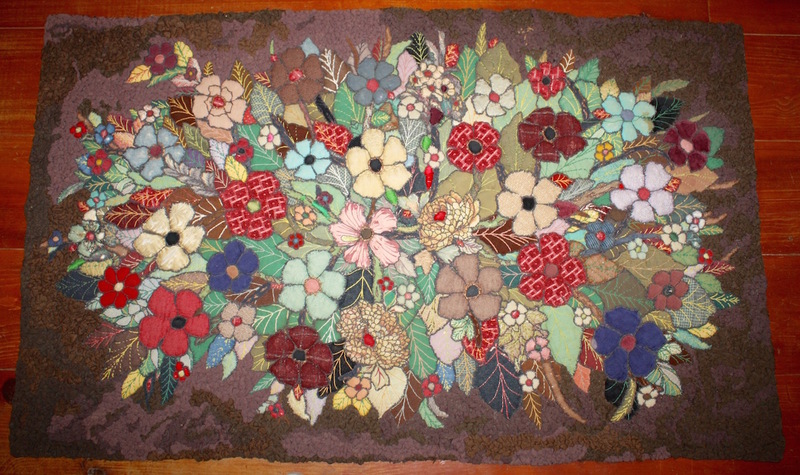 This entry was posted in elements and design in art, Fraktur Design, hooked rugs, rug hooking workshop, Uncategorized and tagged frakturs, hooked rugs, Ruckman Mill Farm, Susan Feller, Susan L. Feller on August 5, 2013 by Susan L. Feller. Ready for a vacation and yet don’t want to travel too far? Think learning about rughooking would be fun too? Canada is a great destination for many New Englanders and those in Northern NY. Loyalist College in Belleville, Ontario is a great setting for both of these goals. 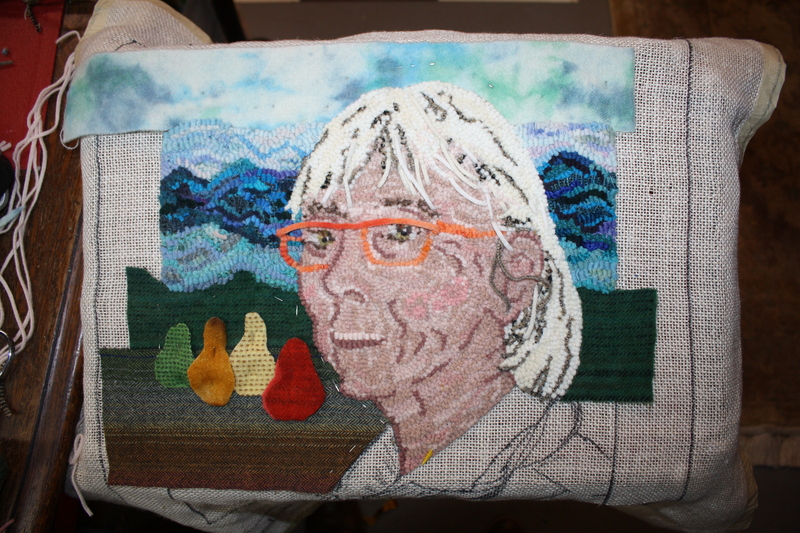 The Summer Arts Program includes three different sessions with rug hooking artists, of course I would recommend July 16-20 with me! 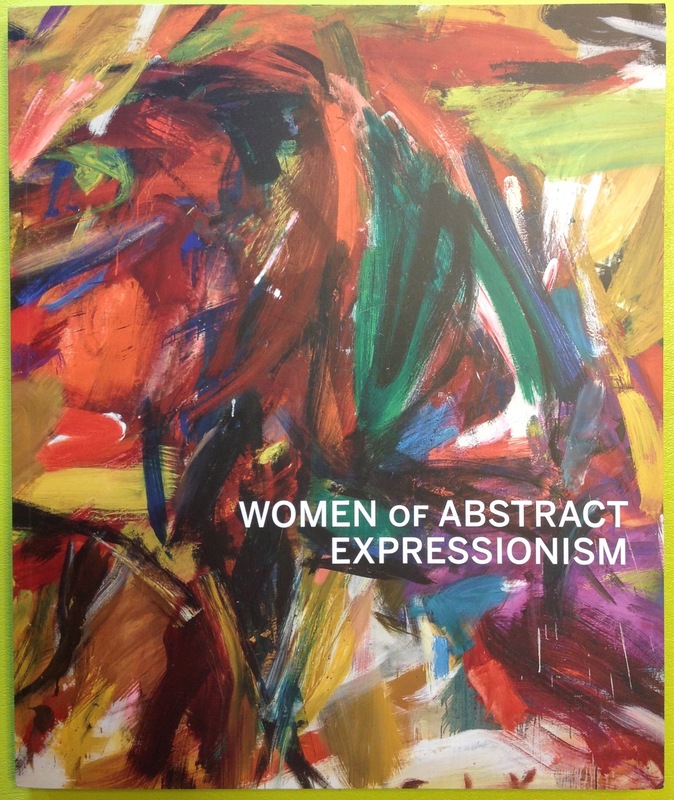 See the full catalog here Summer Arts 2012 Loyalist College, Belleville, ON Registration begins April 13. 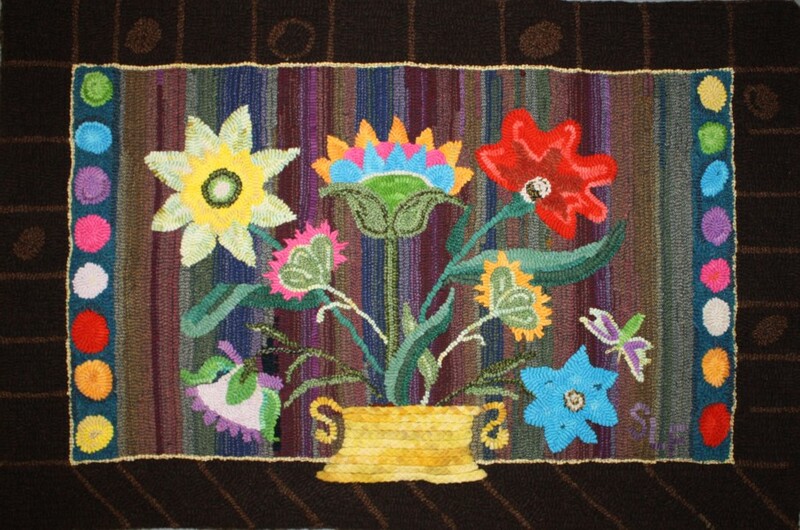 This entry was posted in elements and design in art, hooked rug workshop, rug hooking workshop, travel and tagged canadian rug hooking, Loyalist College, Ruckman Mill Farm, rug hooking, Susan Feller on March 26, 2012 by Susan L. Feller. Feeling abit like the Royal Couple, (Will and Kate), I have been in Canada since June 24th, hosted by Susan Sutherland in the Kitchener/Waterloo area to conduct a fraktur design workshop within the Mennonite region of the design source. 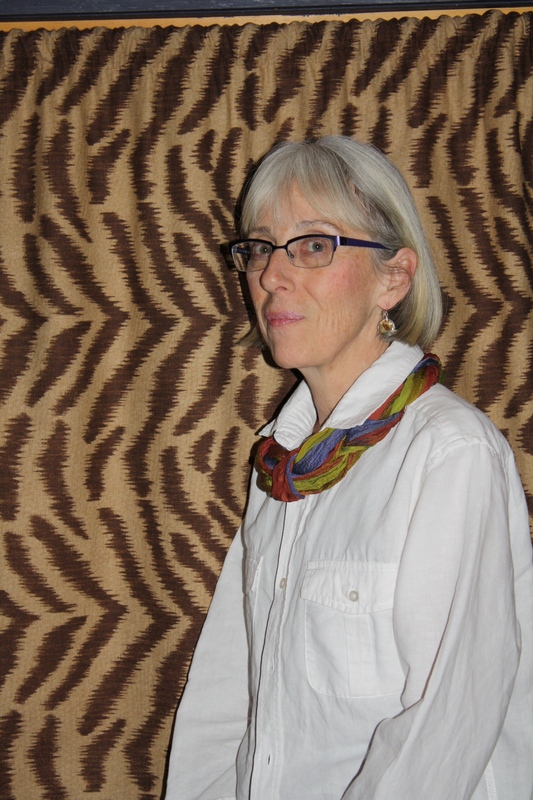 The following hostess was Anne Boissinot who lives near the McMichael Collection in Kleinburg. We toured this museum complex for a full day, exchanging our artistic views. 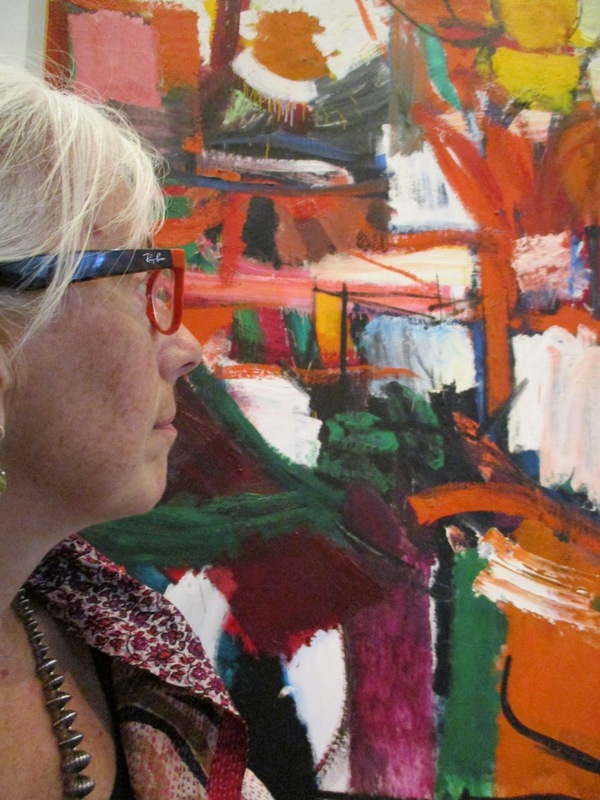 What a great way to learn– visit a museum with a friend with similar interests. I stopped briefly at Rittermere-Hurst-Field to lunch with Jeanne Field, Andrea Shepphard and the family/workers. Will be back for the Circle of Friends on July 9th in Aurora. See www.Letshookrugs.com for information. Now in Belleville for the two weeks, enjoyed Canada Day by touring Prince Edward County. 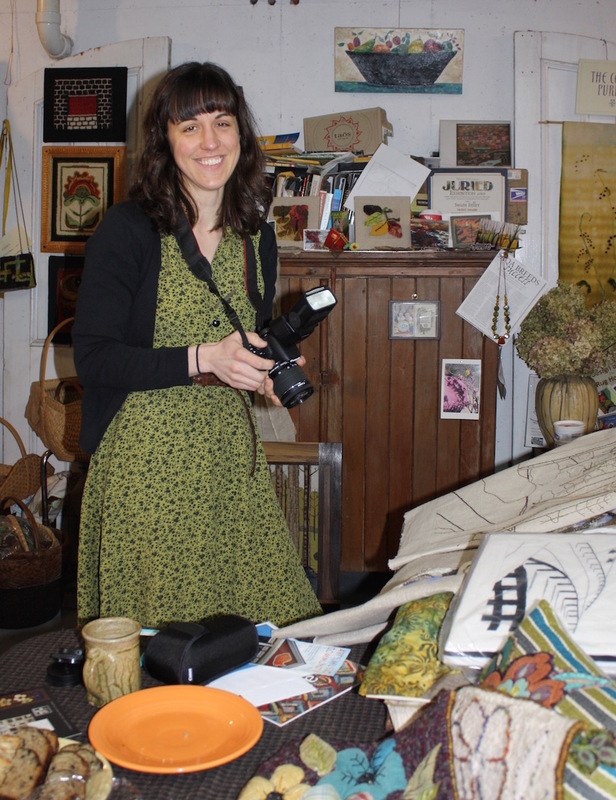 Art exhibits, farmers markets, and a beautiful day all recorded in my mind or on camera. Took shots of the sun moving across a mowed field highlighting bands at a time. The square bales were stacked in pyramids to be picked up later. Shapes, light and values were on my mind since this is the theme for the Loyalist College class beginning July 11th. www.Loyalistfocus.com see Susan Feller for details, opening in class still. 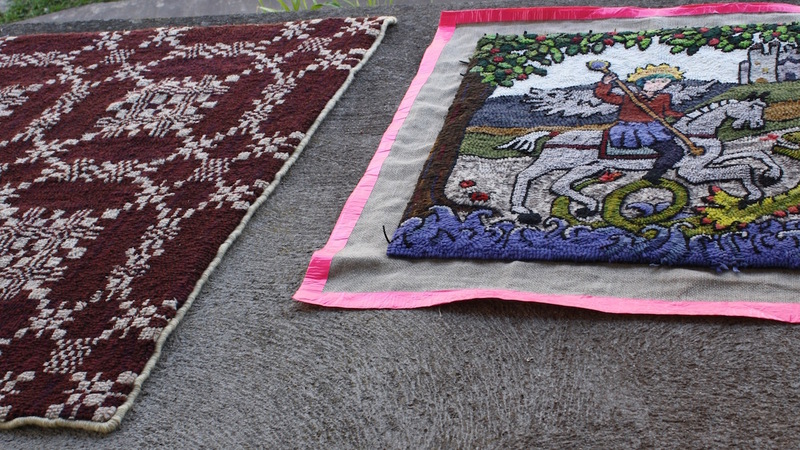 This entry was posted in rug hooking workshop, travel, Workshops and tagged canadian rug hooking, frakturs, hooked rugs, rug hooking, Susan Feller on July 2, 2011 by Susan L. Feller.